Topic: Day to Emmons conversion? Recently bought a nice GFI SD10 Ultra 3x5...It has the Day conversion. Need to convert it to Emmons or if the cost is too high, just sell it as is. Any idea of who could do this for me in the Oklahoma/ Texas area? Those are easy to change. 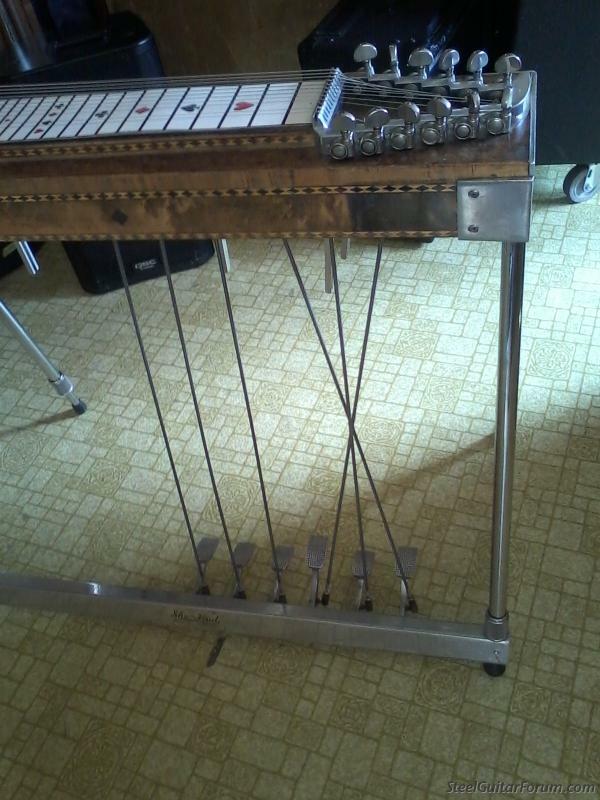 Anyone with basic skills of steel guitar could do it. It really should be easy. First thing: take detailed pictures of exactly how the guitar is set up now. Pay close attention, and make detailed notes, of what changer hole and what bell crank position each rod is in. Then you simply unscrew the tuning nut, disconnect the rod at the bell crank, and reinstall that same rod in it's new position using the changer and bell crank position appropriate for it's new function. You will need to slide the bellcranks to their new positions. Make sure the bell cranks are positioned so the rods pull straight. Put the tuning nut back on and tune it up. You may need to adjust the pedal stop, or maybe not. This applies to flipping the A and C floor pedals. If you need to change knee levers, it should be the same basic procedure. Or go see Lee (see below). C'mon by my house tomorrow and we'll work on it together! We'll swap both the pedals and the knee-levers. Would love to, but that is a way down there...did you know Roy Parker from down there? Sounds and looks relatively simple...maybe I'll give it a shot. Lee's is the place to go--barbeque, and outstanding musicians on the porch every night. But on changing Day to Emmons, I could only ask, why? Just kidding. Think of it as replicating the C pedal on A and vice versa. 5th lever stays the same, right? GFIs are very easy to work on. Pretty simple to make changes, very easy to move the bell cranks without removing the cross-bars. Regarding knee levers, you probably just want to reverse the E raises and E lowers. There is most likely no reason to touch the other levers. I was gonna say take notes of where everything is before you start, but I guess with a rod chart you don't even need to do that. It's not all that complicated and good to learn how to work on your own guitar. But won't those notes also sound out of phase? Alan hasn't shown up yet; so I went ahead and fixed a sandwich. Posted 10 Jan 2018 3:34 pm Day to Emmons conversion. A No.2 philips screw driver. A proper size allen wrench for the bell crank rod connectors. You do not have to remove the plastic tuner nuts just check you have plenty of adjustment on them so when changed it will tune up. Bought a GFI 12U that was set up Emmons changed to Day and moved the D & F knee levers to RK was easy. Just take pictures and diagram rod holes in changer and bell crank. With rodding chart it should be easy. There should be all the rods of proper length you need you just have to move them to their new location. Good Luck and Happy Steelin. I suggest to learn the Day Way.... the ergonomics is much better, as you would soon learn. I know this has been beat to death but I cant understand why there are so many more Emmons players than Day players. I guess everyone in earlier times wanted to be more like Buddy in their set ups so that became the norm over time. Day set up is much easier and makes much more sense to me and always has and I first learned Emmons setup and switched after about 3 years. i agree, but whaddo i know. When I brought my first steel home I had no prior experience with setups. So I backed off the 4th string raise on the C pedal which gave me both Emmons and Day on the same guitar (ADA, at least in the upper octave). I figured if I preferred Day I would switch it around to that, if they were about equal I would use Emmons because it is more common, and if I liked Emmons better then I would tune the 4th string back up and my life would be easier. My foot and my brain had a strong preference for A on the left, so good for me. I got to learn on something that was immediately comfortable and also was conveniently the standard. I don't blame you one bit for wanting to switch the GFI to Emmons. Not because I play Emmons or even because it's the most common, but because it's your guitar and you might as well be comfortable. Why change your autopilot now? I would hate to change something so fundamental as how I approach my pedals. I'd rather play music!